My first mission today was to pull apart the top lift cover and replace the bushings for the upper lift shaft. This repair requires complete dissassembly of the top cover, so while I am at it, I will also install an upgraded lift cylinder. 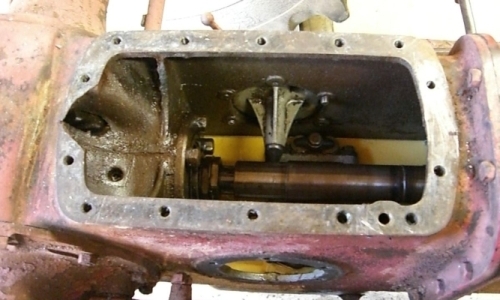 The original lift cylinder uses metal sealing rings that have a gap. The upgraded NAA piston has a single groove for a rubber O-ring and backup ring. This is a test, what do you see wrong? This does not look good. When I pulled the top cover, the first thing that jumped out at me is a big chunk missing out of the housing flange. Flip the top cover over, and there is a similar piece broken out of the top cover. This is old damage. These castings are 1/4" thick. It looks like whatever came loose, and broke these castings, was repaired long ago. None of this damage was visible until the cover was removed. It was not leaking, but this is not a really wet part of the housing. The fluid is mostly down in the bottom of the sump. The main worry is that this spot may have been allowing water and dirt to get into the housing. A test fit with a new gasket showed a gap. 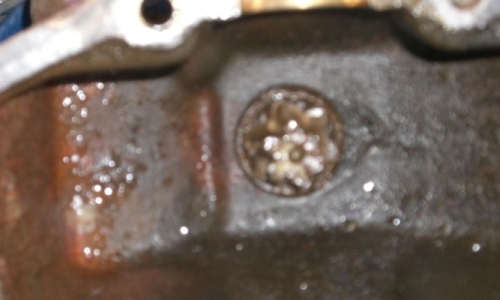 If the broken pieces were still in the sump, it might have been possible to weld them back in place. It won't take much to rebuild enough area so the gasket will work. A little JB Weld ® seemed to work well. On the 8N you simply remove the transmission top cover. On the 9N-2N you have to remove the hood, dash, steering column, and steering sectors first. Pulling the steering column off reveals the steering sectors. Those teeth looked ok. However, one steering arm has a weld on it that looks ugly. 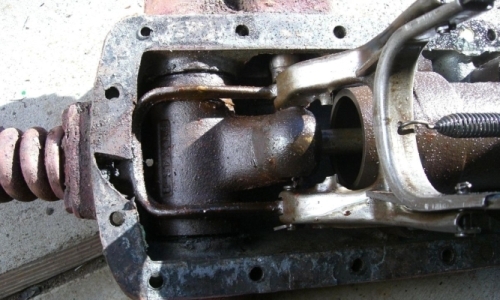 Normally, steering parts should not be welded. This one looks strong enough, and has apparently been working fine for some time. If this was a car, it's not worth the risk. Buy new parts, every time. 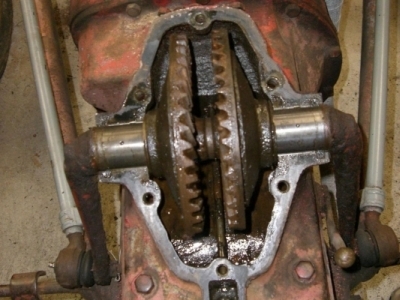 Flipping the steering column over reveals the gear on the bottom of the steering shaft. The bearings and preload adjustment on the shaft were great, but this little gear looks terrible. 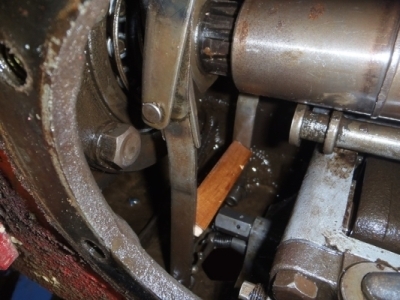 Went on-line to check parts sources and was not happy to discover the gear is part of the steering shaft. Best price I could get was 70 bucks. Saw a couple of used ones that were cheaper, but they were not in much better shape than the one I have. Suddenly 70 bucks for a new shaft seems more affordable. After thinking about it for a couple of days, it seems foolish to stick a new shaft in it with a welded sector arm and who knows how much wear on the sector teeth. This project cost just went up. Finally removed enough stuff to get the transmission top cover off. Replaced the shifter pin, spring, and retaining clip with all new parts. The shifter should work much better now. 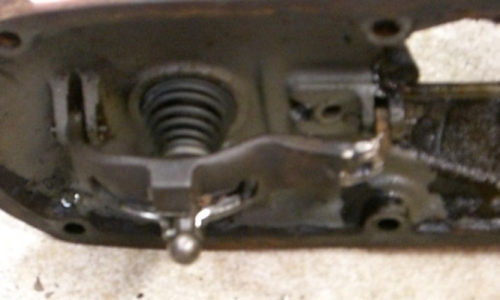 Visible in this photo, wrapped around the shifter spring, is a repair I had to make to the shift lever neutral lock. The non-functional neutral interlock was because the casting was broken. Both parts were still there, but needed to be welded back together. I love a challenge. In this case the welding was easy. The hard part was figuring out how to hold the parts together long enough to weld them. I really should have snapped a photo of the splint made from a piece of coat hanger, stainless tie wire, nut, and bolt. The real beauty was that it left enough room to make a couple of good tack welds. The splint that took so long to make, came off in a moment. It was easy enough to finish welding, grind smooth, and re-drill the slot for the interlock plunger. The photo shows it back together, and almost ready to go back on the tractor. There is a better way to disassemble and re-assemble the 9N/2N touch control linkage. I cut a small block of wood exactly 3.75" long to use as a spacer so the fork linkage can be wedged apart and re-connected from one side.